The biggest real estate loser was Anant Raj Industries which dropped by 6.8%. HDIL had the second worst position as it had a drop by 5.7%. Many of the investors are cutting off their real estate shares as there is no sign of any immediate recovery. Mr. Deven Choksey, MD of KR Choksey Securities said that the recovery is possible only if the interest rate is lowered. He added that the economy also should do well. 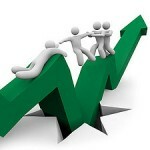 Beating the Sensex, the BSE real estate index had risen 22 % in September in which the Sensex achieved a 7.6% of growth. Stock investors are again flowing back to technology or defensive stocks. They show a negative sentiment towards the real estate stocks. Banking sector and other capital goods sectors also face negative sentiment. S P Tulsian, an independent stock market analyst, said that the real estate stocks might improve by 5% from the current levels. He cautioned that some individual- stocks might fall deeper. DB Realty remained an exception to this. This was the sole real estate stock which bounced 5% upward to reach Rs.103.65. This jump was mainly because Rare Enterprises of Rakesh Jhunjhunwala had bought 1.25 million DB real estate shares. Stock experts have already warned the investors to purchase real estate shares cautiously. They predict that the shares would not be as profitable as it used to be. This entry was posted in Real Estate News and tagged Bse, DB Realty, DLF, real estate shares, Sensex, Stock market, Unitech by designer. Bookmark the permalink.